Fashion Story is rated 3.8 out of 5 by 4. Rated 4 out of 5 by mrm2006 from Let's Play Dress-Up! This is a typical match 3 game in which you match girly items (shoes, make-up, lipstick, etc.) 3 or more times to turn the "quilt" over. Instead of destroying tiles, you want to change them to a very pretty peach or blue color, making up the quilt. There are no discernible bonuses that I saw for getting matches of 4 or more. Periodically, a purse will open in the bottom right of the screen. Click on the purse FIRST, then select an item on the board and away it goes, into the item. A great way to get rid of an item stuck in a corner or something. Clear the board quickly and get an extra life - they will come in handy as you level up. There are hindrances as well. Sewn items - just match them up with their like items. Hammers - don't get them to match 3 or more because they'll reverse the color of the board and you'll be matching in that spot again. Although, sometimes I found it's easier to match the hammers and quickly make other matches in the same place to get that board turned. Hammers and sewn items can go into the purse as well. YAY. Now, the purpose of all this matching is because a friend of yours has called with a fashion emergency. On the way to her house, you shop til you drop and every time you complete a level, something about her changes. 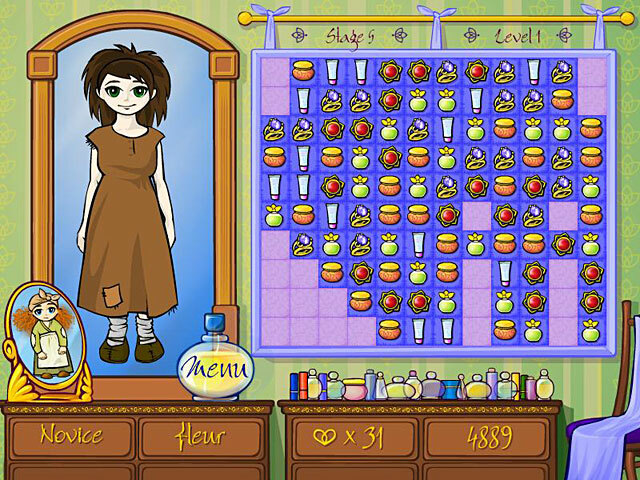 Her figure is standing head to toe on the left side of the game board. My dislikes about the game? Only one. I played about 15 levels in the free hour demo and this girl had changed her appearance perfectly. Do we work on her for the entire 100 or so levels or do we go to another person's aid. For this reason, it won't be a purchase for me. 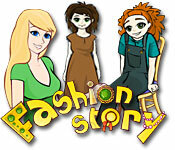 I think this would be great not only for lovers of match 3 games but tweens and teens who like fashion forward games. Happy Gaming! Rated 1 out of 5 by myyorkies1994 from Nothing New Here... This is a match 3 with nothing new. As you complete each level the frumpily dressed girl's outfit upgrades. The timer is generous and the board configurations do get more complex as the levels increase. There are much better games to choose from.